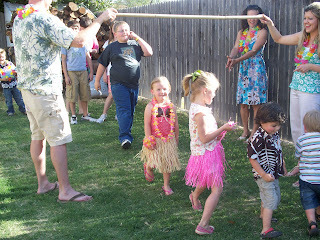 Last night our life group leaders' little girl had a luau birthday party. 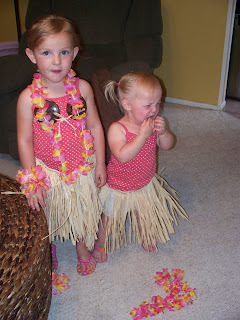 I took the girls to get little outfits for the party. Anyone who knows my girls can guess exactly what happened...Reese would have absolutely nothing to do with dressing up, while Jessilyn ate it up and was a big cheese! Jessilyn even had to have the coconut bra, and to be honest, I'm a little concerned about how excited she was to be wearing a bra! Enjoy the pics! Happy birthday Piper! They are so cute! I miss them (and you too of course!) so much! Thanks for the help on Sat. you can look online at the stuff we registered for at Babies R Us and tell me if there is anything else I will need. This is just flat out hilarious!! 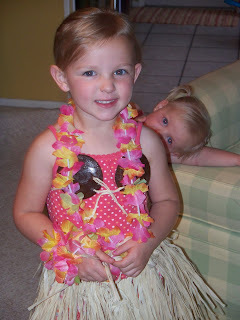 Reese is hating life and Jessilyn is lovin' what her mama gave her:):) Yall are tooo cute! Love you! Oh my goodness...your girls are so dang cute! I love Jessilyn's coconut bra...that is awesome! I can not beleive how big they are! Reese was just a baby rolling around on the floor last time I saw her! It's crazy how fast they grow! How far apart are your girls? 26 months to the day. Are you debating #2?!? Oh my goodness! 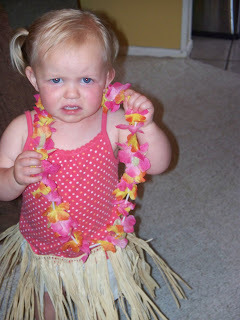 Sooo cute... and the coconut bra is priceless!! Our house is on the market, and I'm not sure what qualifies as wheelchair accessible? why? I miss you dear friend! WE def. need to talk soon... I'm just trying to get things packed and keep my sanity! how did you do it? I'm excited to talk to you soon!